I was actually to write a recipe of home made pav. Yes, yesterday I made pav [soft bread or buns] at home for the first time. The house filled with aroma reminded me of bakeries serving freshly baked ladi pav [Slab of soft buns]. 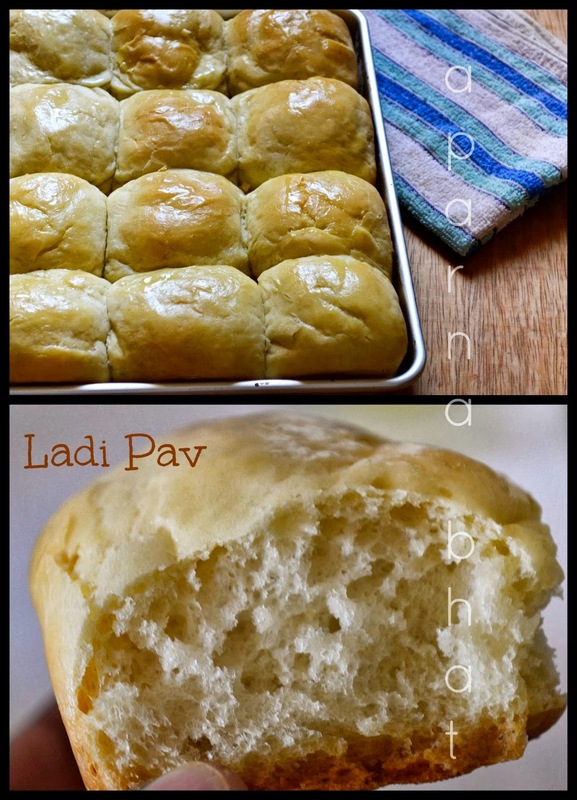 You can see the results in the below pic, don't they resemble the ladi pav ? I was happy with the results, but a thought came up,,, this was the first attempt and there was still a room to improvise myself. So I need to hold back posting its recipe at this time. I should try it few more times, experiment the same recipe by replacing it with wheat flour [if its successful than that would be a healthy option instead of maida]. 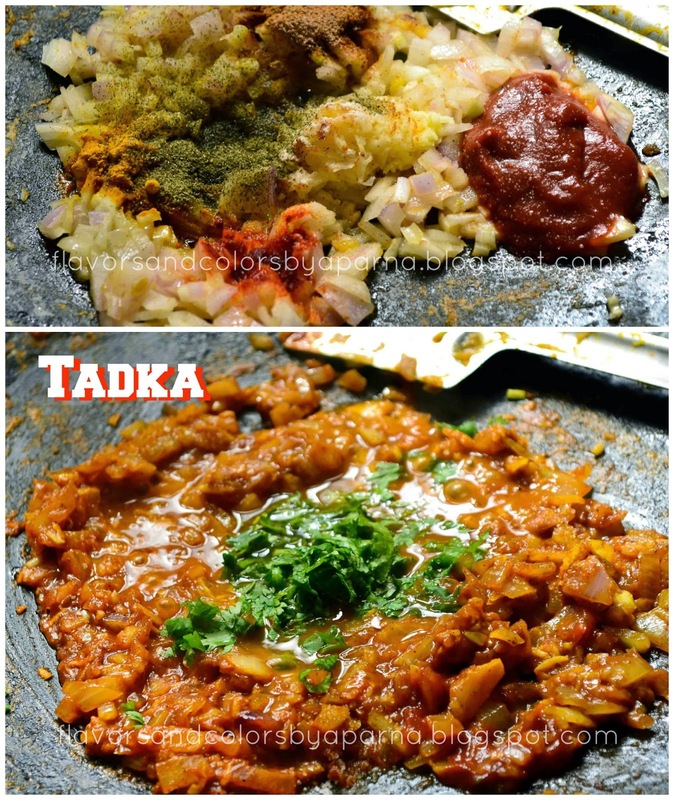 I have made this bhaji countless times following SK and TD recipes. This time followed the instructions as shown in the video here. 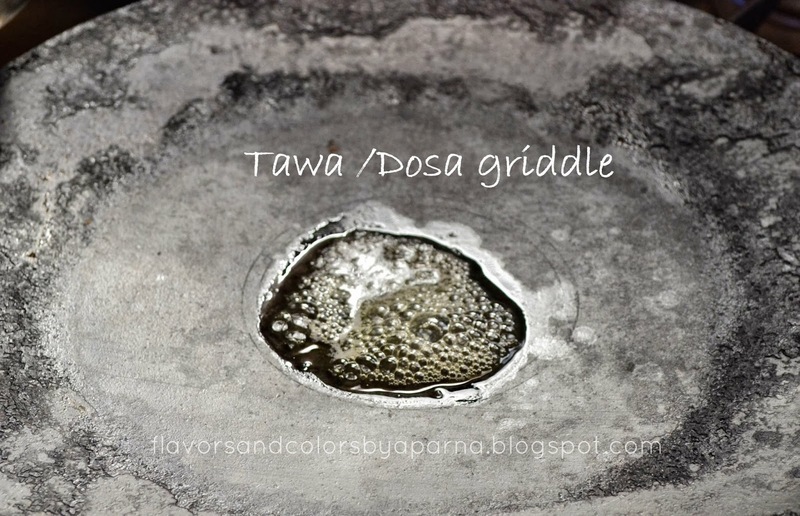 I usually do it in a deep pan but after seeing it being made on big iron griddle in the video, did it on tawa/ dosa griddle as seen in below pic :P. The aroma and superb taste of this dish prepared on a tawa is sure to linger. Heat a tbsp of butter on the griddle. Once hot, place finely chopped capsicums on it. Saute it for 30 secs now sprinkle some water to soften them a little. 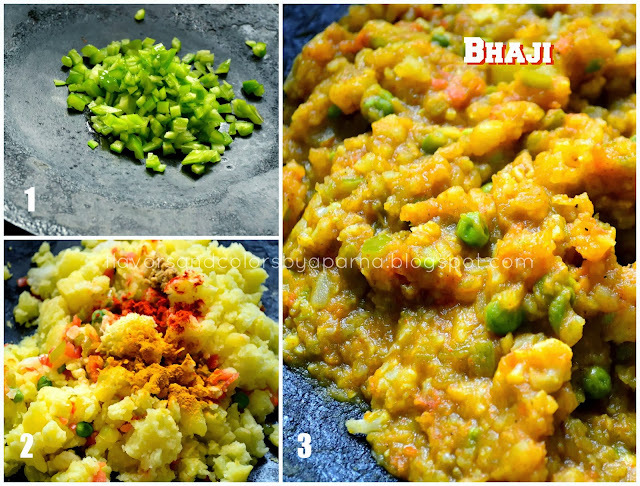 Add chopped tomatoes, boiled potatoes mashed with hand, blanched green peas and cauliflower florets. Stir them nicely and allow them to cook for a minute. Next add chili powder, ginger garlic paste, turmeric powder and stir it well. Add some water to make the veggies tender and prevent them sticking to the griddle. Add remaining butter and stir for a while. Now mash the veggies with the help of masher. Add more water bring it to boil. 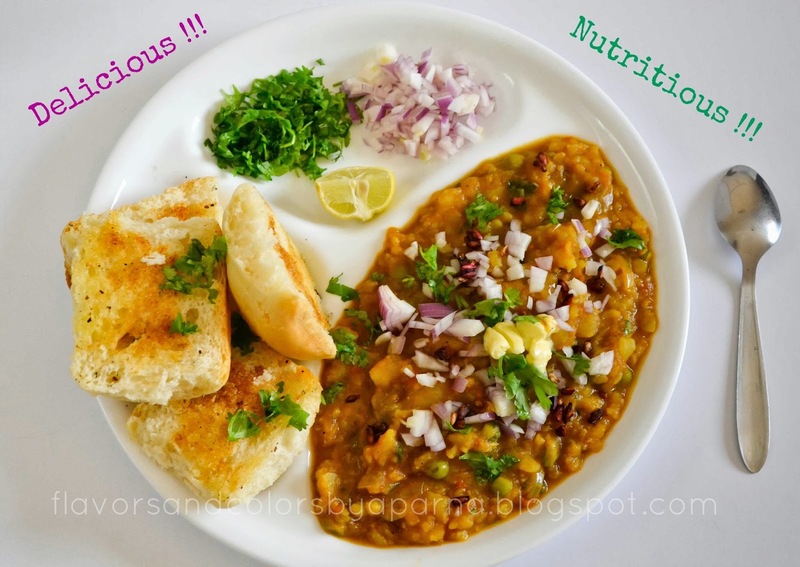 Sprinkle pav bhaji masala powder, salt as per taste and coriander leaves and cook it until the bhaji thickens. Once the bhaji gets done shift it in another vessel/ pan. Now heat butter once again on the griddle. Add chopped onion and saute them for few seconds. Add grated garlic ginger, red chili powder, pav bhaji masala powder, pinch of turmeric powder, crushed dry kasuri methi powder, tomato paste, coriander leaves, pinch of asafoetida and salt as per taste. [Plz remember we have already added salt to the bhaji before, so adjust the salt accordingly]. Sprinkle some water if the mixture gets dry. Saute them for a minute and mash it with masher. Mix the tadka to the bhaji in the pan. Keep the pan on flame again and stir the mixture nicely. [If you don't prefer a fully mashed bhaji then keep aside half a cup of boiled mixed vegetables aside which you can add to the bhaji mixture now while cooking]. Adjust the water as per preferred consistency and you can alter the spices to suite your taste. Cook on sim flame for 5 minutes and later switch off the flame. Slice each pav horizontally and apply little butter on each side. 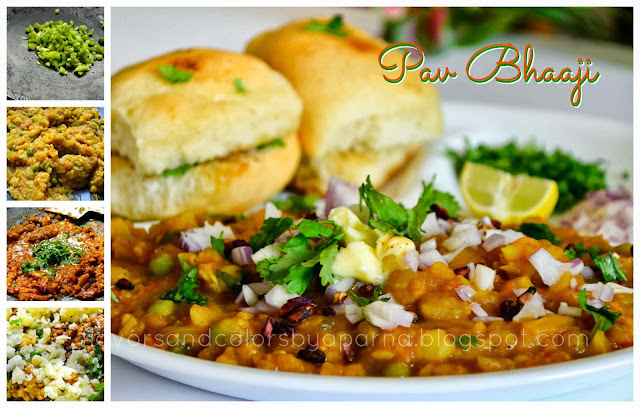 Sprinkle some pav bhaji masala and cook the pav until they turn golden brown on both sides. Enjoy this delicious treat. Happy cooking! Note: Regarding the use of dosa griddle/ tawa you can carry on the steps in the deep thick bottomed pan itself.